All-in-One is all you need! 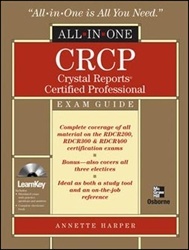 This authoritative reference offers complete coverage of all material on all three Crystal Reports Certified Professional exams, including content for each of the three electives. You'll find exam objectives at the beginning of each chapter, helpful exam tips, and end-of-chapter practice questions. The bonus CD-ROM contains a testing engine with questions found only on the CD. This comprehensive guide not only helps you pass the challenging CRCP exam, but will also serve as an invaluable on-the-job reference.